The full indictment is here. What this says is that Manning hacked a DoD computer and found the hash "80c11049faebf441d524fb3c4cd5351c" and asked Assange to crack it. Assange appears to agree. So what is a "hash", what can Assange do with it, and how did Manning grab it? Computers store passwords in an encrypted (sic) form called a "one way hash". Since it's "one way", it can never be decrypted. However, each time you log into a computer, it again performs the one way hash on what you typed in, and compares it with the stored version to see if they match. Thus, a computer can verify you've entered the right password, without knowing the password itself, or storing it in a form hackers can easily grab. Hackers can only steal the encrypted form, the hash. When they get the hash, while it can't be decrypted, hackers can keep guessing passwords, performing the one way algorithm on them, and see if they match. With an average desktop computer, they can test a billion guesses per second. This may seem like a lot, but if you've chosen a sufficiently long and complex password (more than 12 characters with letters, numbers, and punctuation), then hackers can't guess them. As this image shows, it'll take about 22 hours on my laptop to crack this. However, this doesn't succeed, so it seems that this isn't in the NT format. Unlike other password formats, the "NT" format can only be 7 characters in length, so we can completely crack it. Instead of brute-force trying all possible combinations of characters each time we have a new password, we could do the huge calculation just once and save all the "password -> hash" combinations to a disk drive. Then, each time we get a new hash from hacking a computer, we can just do a simple lookup. However, this won't work in practice, because the number of combinations is just too large -- even if we used all the disk drives in the world to store the results, it still wouldn't be enough. But there's a neat trick called "Rainbow Tables" that does a little bit of both, using both storage and computation. 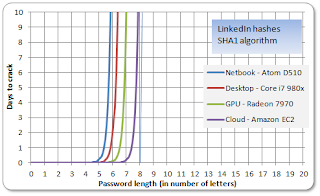 If cracking a password would be of 64 bits of difficulty, you can instead use 32 bits of difficulty for storage (storing 4 billion data points) and do 32 bits worth of computation (doing 4 billion password hashes). In other words, while doing 64 bits of difficulty is prohibitively difficult, 32 bits of both storage and computation means it'll take up a few gigabytes of space and require only a few seconds of computation -- an easy problem to solve. That's what Assange promises, that they have the Rainbow Tables and expertise needed to crack the password. However, even then, the Rainbow Tables aren't complete. While the "NT" algorithm has a limit of 7 characters, the "NTLM" has no real limit. Building the tables in the first place takes a lot of work. As far as I know, we don't have NTLM Rainbow Tables for passwords larger than 9 complex characters (upper, lower, digits, punctuation, etc.). I don't know the password requirements that were in effect back then 2010, but there's a good chance it was on the order of 12 characters including digits and punctuation. Therefore, Rainbow Cracking wouldn't have been possible. If we can't brute-force all combinations of a 12 character password, or use Rainbow Tables, how can we crack it? The answer would be "dictionary attacks". Over the years, we've acquired real-world examples of over a billion passwords people have used in real accounts. We can simply try all those, regardless of length. We can also "mutate" this dictionary, such as adding numbers on the end. This requires testing trillions of combinations, but with hardware that can try a billion combinations per second, it's not too onerous. 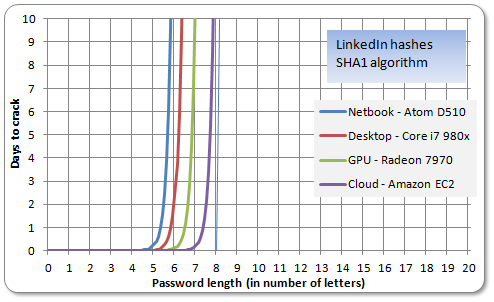 But there's still a limit to how effective we can be at password cracking. As I explain in other posts, the problem is exponential. Each additional character increases the difficult by around 100 times. In other words, if you can brute-force all combinations of a password of a certain length in a week, then adding one character to the length means you'll take now 100 weeks, or two years. That's why even nation state spies, like the NSA, with billions of dollars of hardware, may not be able to crack this password. Now let's tackle the question of how Manning got the hash in the first place. It appears the issue is that Manning wanted to logon as a different user, hiding her tracks. She therefore wanted to grab the other person's password hash, crack the password, then use it to logon, with all her nefarious activities now associated with the wrong user. She can't simply access the other user account. That's what operating systems do, prevent you from accessing other parts of the disk that don't belong to you. To get around this, she booted the computer with a different operating system from a CD drive, with some sort of Linux distro. From that operating system, she had full access to the drive. As the chatlog reveals, she did the standard thing that all hackers do, copy over the SAM file, then dump the hashes from it. Here is an explanation from 2010 that roughly describes exactly what she did. The term "Linux" was trending today on Twitter by people upset by the way the indictment seemed to disparage it as some sort of evil cybercrime tool, but I don't read it that way. The evil cybercrime act the indictment refers to use is booting another operating system from a CD. It no more disparages Linux than it disparages CDs. It's the booting an alternate operating system and stealing the SAM file that demonstrates criminality, not CDs or Linux. Note that stealing another account's password apparently wasn't about being able to steal more documents. This can become an important factor later on when appealing the case. The documents weren't on the computer, but on the network. Thus, while booting Linux from a CD would allow full access to all the documents on the local desktop computer, it still wouldn't allow access to the server. Apparently, it was just another analyst's account Manning was trying to hijack, who had no more permissions on the network than she did. Thus, she wouldn't have been accessing any files she wasn't already authorized to access. I don't know his argument, he hasn't posted his promised blogpost yet, but I assume it's something similar to the Nosal case: just because somebody later does something unauthorized with the documents, like hand them to a third party, if they were authorized to access the documents in the first place, then it's (possibly/probably) not a CFAA violation of "unauthorized" access. Thus, from this interpretation, while Assange appears here to go beyond journalistic practices and help hack, it still may fall short of a CFAA violation. Many are worried that Assange is being prosecuted for journalism. I'm not sure the evidence shows one way or the other. The indictment isn't for acts of journalism, such as publishing the stolen documents, but for acts of hacking, which every journalistic organization calls unethical. Ethically, while you can publish the fruits of a crime, you can't participate in the crime. If a journalist breaks into your home to steal documents, it's still a crime -- they can't hide behind the shield "but I'm a journalist". On the other hand, the hacking Assange is being accused of here seems to be pretty weaksauce. It seems like a thin justification to prosecute him. In other words, it's like how they prosecuted Al Capone for tax evasion rather than what they really wanted to prosecute him for. I was taught that was a clever use of the system in order to go after Capone, but here it seems like a corruption of the system in order to go after Assange. One question I have for legal experts is whether this prosecution is politically motivated. We do a lot in this country to shield prosecutors from political influence from the top, which means prosecutors shouldn't be influenced by what Obama or Trump want. On the other hand, they are human, and Assange is a famous target, and I can imagine a prosecutor wanting to make a name for themselves by going after such a famous target. Prosecutors have a lot of discretion, which means they may not indict some 18 year old nobody for helping crack a password, even though it may technically be illegal, but it also means they also have the discretion to go after such a big target as Assange for the same crime. Note that booting from a separate CD meant Manning could easily hack the desktop computer, installing viruses/malware, changing account settings, and so on. Presumably, though, this would leave traces, so she didn't want to go that far. Merely booting an alternate system to steal passwords, then use those passwords, wouldn't leave any significant traces. Many legal experts claim this is just the first indictment, that will probably see a superseding indictment later on with more changes. For the moment, however, this blogpsot discusses the technical details behind what's currently being charged. As more charges of hacking appear, I'll try to write them up here as well. This entry was posted in Uncategorized on April 11, 2019 by Robert Graham (noreply@blogger.com).